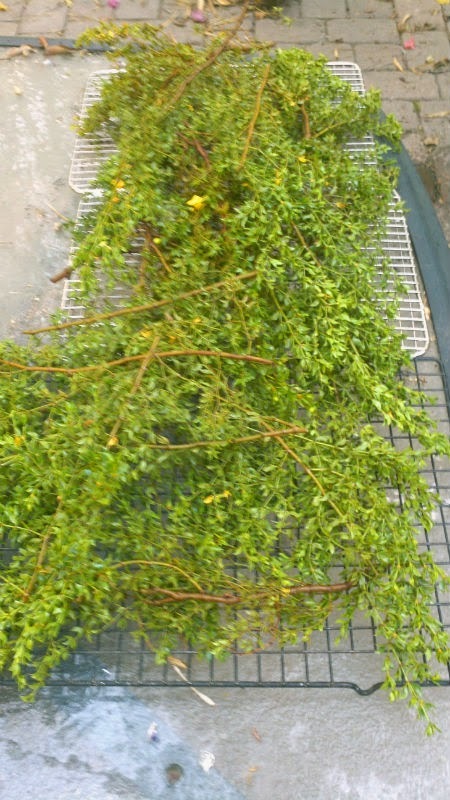 Today I harvested 282 grams of larrea tridenta from bushes on our property. I selected small, dense branches from the lower and shadier side of the plants. I chose new growth without buds or flowers. My reasons for doing this are twofold. I also took less than 1% of any given plant and only harvested from thriving, dense plants that were not stressed. The branches and leaves fit into a 2 pound ziplock bag that I left open to the air on the ride home. Once home I rinsed the branches and leaves in cold water to remove dust and debris, but not the protective oils. I was surprised to find the branches forming foam. Another quick rinse and a shake removed this. I read up and found that larrea tridentata does contain saponins, or soaps, and this is what caused the foaming. In addition, the leaves had become very sticky to the touch since cutting and stained the ends of my fingers green. I arranged the branches on baking racks on the patio to air dry. I am interested in making a tea and a salve, but have been warned about kidney and liver damage with chaparral - the inaccurately named processed and powdered version of larrea tridentata. I looked through numberous documents on larrea at the National Institute of Health, and found the one below that suggests care, using low doses of the plant while avoiding the processed versions. The safety of low-dose Larrea tridentata (DC) Coville (creosote bush or chaparral): a retrospective clinical study. More on this amazing plant in coming posts. I'm now making the larrea infused oil. I chopped up 75 grams of the larrea I harvested and put it in my new mini crockpot and covered it with 600 grams (about 3 cups) of high quality olive oil. I'm putting the crockpot on the warm setting (at 10:00 a.m.) and will let it sit through most of the day. 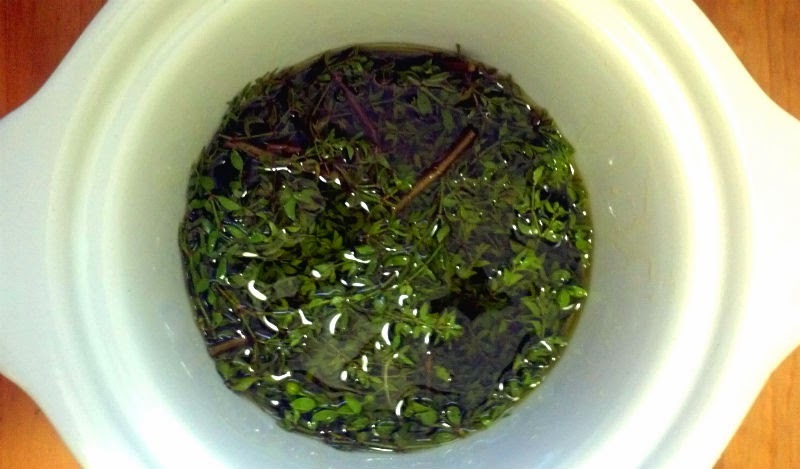 This was before I added the final 100 grams of oil, so the plant matter is submerged in oil. 1. Complex responses within a desert bee guild (Hymenoptera: Apiformes) to urban habitat fragmentation.